Die Herausforderung auf dem Tilda & Co challenge blog von dieser Woche war "Shiny Silver". Also sollten wir auf unseren Karten irgendetwas glänzendes, silbriges verwenden(wie zum Beispiel eine Spiegelkarte, einen silbrigen Draht oder Ähnliches). Keine leichte Aufgabe, aber ich habe das beste daraus gemacht. Ausserdem habe ich die Challenge zum Anlass genommen eine Geburtstagskarte für meinen Mann zu machen (der nächste Woche ansteht). Es ist keine herkömmliche Geburtstagskarte geworden, aber eine die meine Liebe für ihn ausdrückt. Es fiel mir schwer die silbrigen Elemente der Karte mit dem Fotoapparat einzufangen, deswegen habe ich zwei Fotos gemacht. Ich hoffe ihr bekommt einen ungefähren Eindruck davon wie die Karte in Realität aussieht. Ich hatte Glück dieses fantastische Hintergrundpapier in meinem Scrapbooking Laden zu entdecken, das diesen tollen silbernen Schnörkel drauf hat. Den kleinen Schlüssel, den Tilda in der Hand hält habe ich mit meinem Cuttlebug "hearts and stamps" die gemacht. Das winzige Herz im Korb habe ich auf einen kleinen 3D Schaumstoff Block getan. Die brad-Herzen in der Mitte der Prima flowers sind ebenfalls siber. Danke fürs Schaun! Ich hoffe sie gefällt euch! This weeks challenge on the Tilda & Co challenge blog was the following: "Shiny Silver - Right you may be wondering shiny silver? What ? , Well it could be Some shiny mirror card, could be some metal work/wire , what about little shiny mirror tiles? Or sequins as long as there is shiny silver on your work ,to give it that shine and to show off you lovely little magnolia stamps. Anything goes." A really hard challenge, but I tried to make the best of it and used the chance to make a birthday card for my husband(which comes up next week). Not the traditional kind, but one that expresses my love for him. I had troubles to capture the shiny silver on the card with my DigiCam and the scanner had the same problems. So I took two photos and hope that you can get an idea of what the card looks like in reality. I was so lucky to discover this gourgeous background paper at my local crafting shop with this great silvery swirl on it. I did the small key, Tilda holds, with my cuttlebug "hearts and stamps" die out of aluminium foil and I put the small heart in her basket on a tiny 3D foam block. The heart-brads in the middle of the Prima flowers are silver too. Thanks for having a look at it, I hope you like it! It is lovely, I like the soft colours. Ich bin verliebt, was ist die schööön. Tolle Karte. Ich bin hin und wech. Eine ganz edle Karte mit tollen kleinen Details. Gorgeous card and that background paper is something special. I love all the little touches of silver you've managed to include. wow ~ this is stunning! 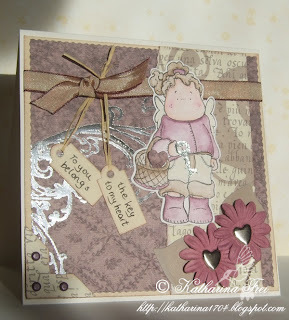 Beautiful card, the colours are gorgeous, soft and subtle. Love the little key and the sentiment! Thanks so much for the nice comments you left in my blog. I am very happy to be part of blogs which inspire, I am very honoured and I thank you very much. Ooh, really love this, the colours, layout, everything - soo pretty! what a beautiful cards you made and so cute. Wow! Die Karte ist wieder wunderschön geworden! Das Silber ist echt toll eingesetzt! Out of this world!! love the colours.. and thanks for your email too :) Let me know if you stil want to go ahead with what we talked about think it will look fabby! 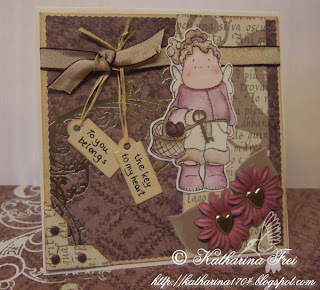 What a beautiful card Katharina, the colours are lovely and the background paper is just perfect. Your husband will love it! This is very beautiful! i think you did a great job in your use of silver. Lovely coloring and design. ich find du hast voll das Händchen für Farben. Every 200 hundred or so items I thought I would be at the end or let's say the beginning. We this is as far as I go. I didn't read everything however I did look at all the pics. I love Henry.